The San Francisco 49ers kneeled neatly in rows during the national anthem today in Arizona. The team called for social justice of all Americans. The 49ers showed a display of unity prior to playing the Arizona Cardinals on Sunday and urged others to follow their example. The 49ers players, coaches and staff formed two lines along the team’s sideline at University of Phoenix Stadium. 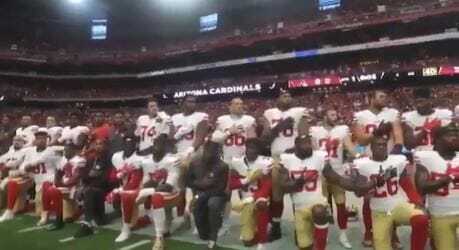 Approximately 30 players took a knee during the playing of the national anthem, while the remaining members of the sideline staff stood behind them while saluting the flag. It was the 49ers’ first game since President Trump, in a Sept. 23 speech in Alabama, advised NFL owners to get rid of any player who kneels during the national anthem.